For VCL support, please email vcl-support@umd.edu. 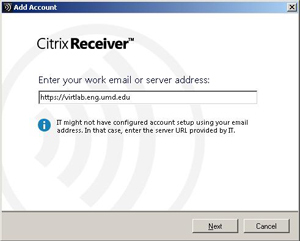 Note, as of August 2018, Citrix is replacing the Receiver with Workspace App. Your Receiver client will still work, but to be working with the latest updates and and upgrades, we recommend switching to a new version of Workspace App when you have the opportunity. The links below have been modified to link to the Workspace App for each operating system. Windows - Choose the Download button for "Citrix Workspace App". 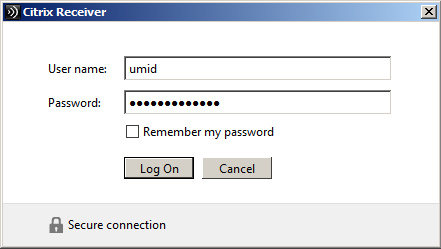 When prompted, enter https://virtlab.eng.umd.edu as the web server and at the login dialog enter your UM directory ID and UM directory password. Once you set up Receiver Enterprise, you can access VCL applications from the Start menu < All Programs < ENGR VCL (you can still launch apps from the webpage as well). Linux -Linux installation requires an extra step to set up the drives. See Mapping Client Drives also can use Preferences or Accessing your PC Drive and Local Printer from the Citrix Session" about 3/4 down on the Citrix ICA Client How To page. Mobile- The server is https://virtlab.eng.umd.edu, and when logging in, the domain is AD.UMD.EDU. After installing the client, go to Login page and enter your Directory ID and your directory password. After logging in, click on an application to run the program. 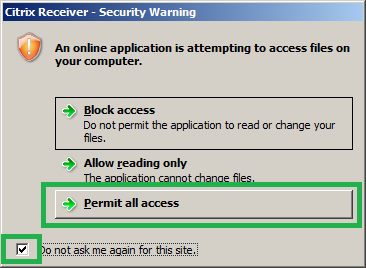 When prompted, choose "Permit all access" to allow the VCL to access your machine for opening and saving files. Check the "Do not ask me again for this site" box to not be asked every time you use the VCL from your computer. Save in either \\Client\C$ or V:(location will vary depending on the application you’re using). You cannot save to the C: drive, because it is hosted on the application server. On Windows, \\Client\C$ or V: is the root directory of your client computer. On a Mac, \\Client\C$ or V: is your Mac Home folder. Windows users can save files to either the Documents or the Desktop folders on the VCL, as they correspond to the folders on your local machine. Before saving, you should verify that files in Documents or Desktop are indeed pointing to your local system; if not, they will be lost when your session ends. 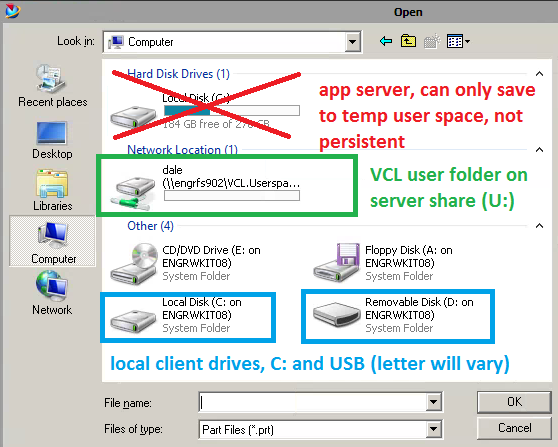 A new option to save to a user folder on a VCL server share. Your folder will be mapped as the (U:) drive. Watch our video on saving to your server folder (U:) and using WinSCP to download files from that location. This is an active service, and no longer a limited pilot. If you participated in the pilot, you do need to authorize any cloud services again. 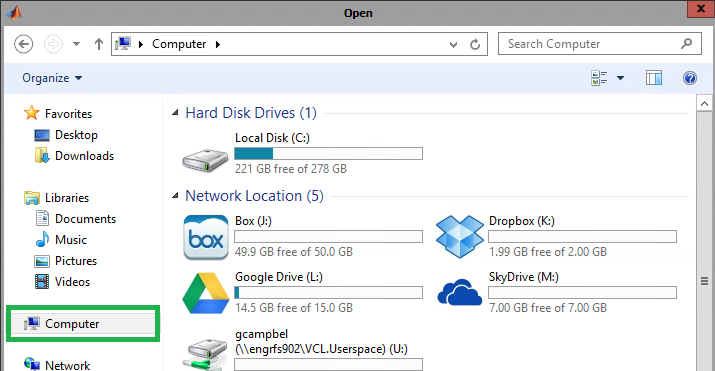 This service will map a Windows drive in your VCL or computer lab session to any cloud storage spaces you authorize (*Box, GoogleDrive, DropBox, SkyDrive). You control what cloud storage services to connect to, if any. To do so, go to kumo.umd.edu and authorize which cloud services you would like to use when using the VCL and computer labs. Then, when launching applications in the VCL, those drives will be mapped as in the image below. Thanks to DivIT for offering this service. On many applications, you will be able to save to other drives on your client machine, such as a USB device or additional hard drive. To save files onto your iPad, you will need to turn on Shared Documents. 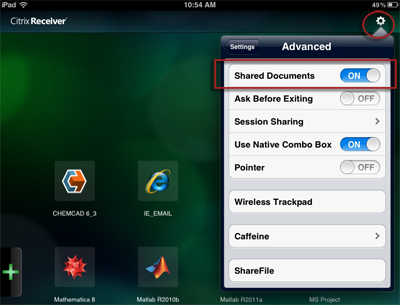 From the iPad Citrix Receiver click the Gear icon in the upper right, choose Advanced, and then turn on Shared Documents. Save locally via the \\Client\C$(V:) just as you would do from a typical VCL session from a PC or Mac. Note: Files saved from the VCL are not accessible from other iPad apps. In most cases, exiting an application will close your session; however, closing some applications (such as ProE, Cadence, and Gambit) don’t always fully your session properly. If you are having trouble running an application you recently closed, your session may not have fully terminated. Right-click on the Citrix icon in the icon tray in lower right-hand corner of the screen. Highlight the server, then Log Off. 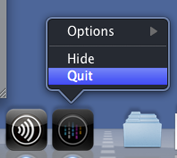 Right click on the Citrix Viewer icon in the Dock and choose Quit. Click the gear icon on the far right of IE9. Your VCL session will disconnect if you do not use your keyboard or mouse for over 3 hours. If network connectivity is lost, sessions will automatically end after 10 minutes. The web interface will timeout after 30 minutes; however, this timeout will NOT quit your application. You only need to be logged in to the web interface to LAUNCH an application. Once you have launched an application, the VCL session is independent from the web browser session (you could close the browser you used to launch the application and your app will still be running). 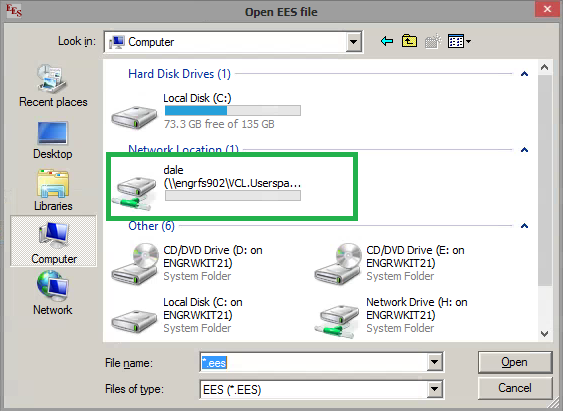 Cadence/PSpice: You should use your personal VCL user space (U: drive) on Windows PCs! Trying to open/save file on the \\Client\C$ may result in an unrecoverable error. Saving locally on a Mac is fine.